Info "Shoot the cans to the bins. I can't be bothered to carry 'em there." 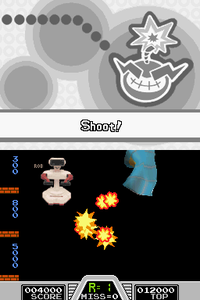 Gunslinger is the boss microgame found in the Retro Action stage in WarioWare: Touched! It is set in a mode of the NES game Hogan's Alley. The object is to tap all the 8-bit cans so they land in the slots on the left, earning the player 300, 800 or 5,000 points respectively. Once this is done, 3D barrels fly in. The barrels have to be tapped repeatedly to destroy them so they release classic Nintendo items, like a Super Scope or R.O.B..
Level 1: Three cans need to be shot. Level 2: Five cans need to be shot. Level 3: Five cans need to be shot, just like in Level 2, except with the top slot blocked. This page was last edited on February 16, 2018, at 18:18.